The PolyScience 7 Liter Refrigerated Heating Circulator provides you with a wide temperature range and precise digital control. This circulating water bath holds 7 liters, and both heats and refrigerates, with a temperature range of -40°C to 200°C ( -40° to 392°F). This recirculating chiller is designed to get you up and running fast, with large, bright digital display showing you set point and actual temperatures, as well as showing input from an external probe all on the same screen at the same time, with icon based indicators for heating, cooling and circulation. 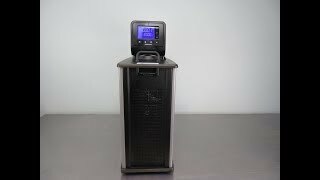 The PolyScience Advanced Digital 7 L Circulator is sturdily constructed for years of dependable use, with a powerful variable speed duplex pump with open- and closed-loop external circulation capability, Dura top top-plate that’s chemical and heat resistant, and built in temperature protection. In addition to having an easy to read screen, this digital lab bath also features a 180° viewing radius, allowing you monitor at a glance from all over the room. This PolyScience 7 Liter Refrigerated Heating Circulator has been fully inspected and is performing to expectations. All of our lab equipment comes backed with our standard warranty. Should you have any questions, please don't hesitate to ask.